In the space between the forest and the stars, nothing is as it seems. Glendy Vanderah’s debut novel begins when protagonist Jo encounters a young girl who claims she's a space alien shows up to shine the light on the secrets she and her neighbors carry in their souls. What's a young girl doing alone in the middle of the Illinois forest, barefoot, wearing only her pajamas? The little star girl calls herself Ursa and says she's from planet Hetrayeh. She manipulates Jo into taking her in, as only a bright, crafty child can. Jo, an ornithologist with a big, broken heart, and Gabe, who sells eggs by the side of the road, who has his own hidden scars, can see there's more to Ursa's story. Ursa claims she came to Earth School to witness five miracles, but she performs as many as she witnesses. Gradually, her inquisitive, insistent innocence nudges Jo and Gabe to find any way to protect her, then to reveal their wounds to one another and grow closer. Together, Jo and Gabe attempt to unravel the mysteries of Ursa’s life. Jo, the naturalist who eventually relents and takes in charming Ursa, lost her mother to breast cancer. She’s recently won her own battle with the same disease. Gabe has lost faith in his mother, his family, and thus, himself. Their trauma pales in comparison to Ursa's, but she’ll do anything to keep them guessing about her past. What bonds this trio, who would not naturally belong together, is the unearthly soul phenomenon called Newfound Love, discovered through common loss. What threatens to separate them lurks deep, dark in the woods and worse, in their wounded souls—in the secrets that protect them but that they find too difficult to reveal even to themselves. This novel rapidly moves from the fantastical and quirky (or quarky, considering Ursa is obsessed with quarks), to all too real darkness. It's Ursa's scars that turn out to be the darkest, and the dangerous wolf that inflicted them might lurk closer than any realize. Despite its first few mystical chapters, the gift this novel yields is more about human nature. Its voice is down to earth. The characters are believable and engaging, and the plot juxtaposes the pace of a thriller in one chapter with the everyday routine of housekeeping and meal preparation in the next, then with the careful, scientific scrutiny of bird habitats and habits. But can Jo protect endangered birds if she cannot protect the people she’s begun to think of as family? In fact, Vanderah, herself an endangered bird specialist, explores most aspects of the human condition, the natural world, and facets of love. This is not a novel about romance, although there is romance. Instead the book delves into the healing power of unconditional love that only a child who has known tragedy can bring to others who are suffering. It's a story of what happens between life and death: both love and loss. 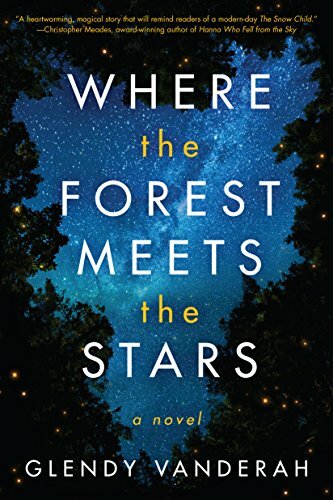 You'll enjoy Where the Forest Meets the Stars and its careful balance between the everyday life, the natural world, and the mysteries of the universe. What began as fairy tale ends in a very real way. Vanderah ’s beautifully human story reminds us that sometimes we need to look beyond the treetops at the stars to let some light into our lives. They shine down upon of us all the time—even through grief and danger. We need only notice. Ursa eventually gets all the miracles she came for. Does a bright little girl who says she's from the stars return to them? Read and find out. Kathryn Brown Ramsperger is the author of The Shores of Our Souls, winner of a 2017 American Book Fest Best Book Award for Best New Fiction and a 2017 Foreword Indie Book Award for Multicultural Fiction. Her novel was also a Faulkner-Wisdom 2016 fiction finalist.